Last week I asked about brussels sprouts on my Facebook page. And you have strong feelings about them! Many of you had a similar experience of hating them when you were kids and loving them as adults. I liked pretty much every vegetable as a child, but brussels sprouts? Those I just would not touch. They were bitter, awful, nasty little vegetables. I don’t know what persuaded me to try them again as an adult, but I did and I realized that, like so many other foods, when cooked right, brussels sprouts are delicious. I still hate steamed sprouts, but when they’re sauteed, they’re pretty decent. And when they’re roasted, they’re even better. In fact, they’re so good roasted that I rarely make them any other way. 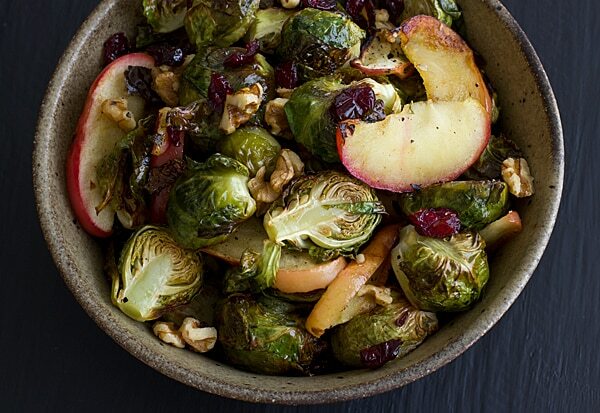 When you roast brussels sprouts, that objectionable bitter flavor disappears. The outer layers get a little bit browned and crispy. And everyone loves browned and crispy! My favorite thing to do with roasted brussels sprouts is to pair them with sweet flavors (like in my Brussels Sprout & Grape Galette). Usually I just go for one sweet addition, but this time I added three: dried cranberries, apples, and a drizzle of maple syrup. If you’re still a little bit dicey about giving brussels sprouts another try as an adult, this is a good recipe to start with. Because there’s a lot of sweetness to counteract the brussely-ness. It’s a beautiful fall side dish and it would look pretty fabulous as part of a Thanksgiving spread. Also, brussels sprouts look like tiny adorable cabbages. How can you say no to wee bitty cabbages? You can’t! How Long Does It Last? A Printable Guide To Fresh Produce What I Ate This Week | Green Tomatoes Meet Guacamole! I mixed all ingredients together,I substituted Barlean’s coconut oil for the olive oil,I also added 1/4 cup organic raisins…OMG, delicious !!! 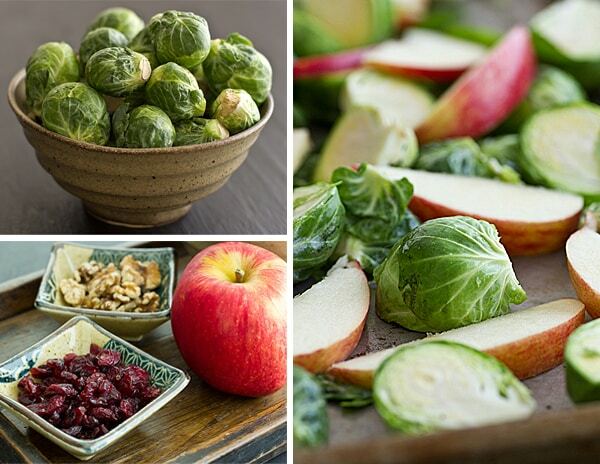 I found your recipe on Pinterest and my husband and I positively love your roasted Brussel Sprouts and Apples!!! It’s pretty enough and easily prpared to serve to company too. One question…What main course do you pair this with? I’m glad you enjoy it! 🙂 We’ve had it as a side with veggie burgers or served it mixed with quinoa or wheat berries as a main dish. Since we don’t eat meat, I don’t usually do a typical main dish + 2 sides type of dinner! I was wondering if you would permit me to print out a few sheets of this recipe and hand it out at my stall at our farmers’ market. we have a coupon program that helps low income young mothers purchase fresh vegetables throughout the summer and early fall. Many of these young women have absolutely no idea how to cook anything but frozen corn and peas so I try to find easy and tasty recipes for them to try. This one is perfect. 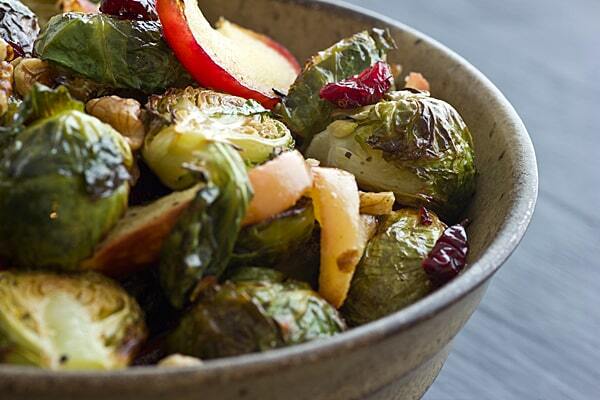 are you talking about fresh brussel sprouts? where i live, i have never seen them fresh but frozen. can i use frozen ones, i actually love brussel sprouts, even with nothing on them. Yes, I used fresh Brussels sprouts. I’ve never tried to roast frozen ones; I imagine that the texture would be quite different. I have always loved brussels…andall 5 of my children do too. We always thought of them as a special treat just served with butter! I made this dish yesterday and just got finished eating some leftovers for lunch! It’s very delish! Thanks for the comment–I’m so glad you enjoyed it! A friend brought this to our annual vegan potluck last month. It was my favorite dish, so she sent me the recipe. I’m making it for our vegan Thanksgiving dinner this year. Thank you for sharing this brilliant recipe with the world! Do you think this can be made a day ahead and reheated? I’m catering a party, and I’m trying to as much as I can a day before. Yes, you can do that, but it’s definitely best when made right before serving. Oh lord I want this right now..